The annual resealing program [PDF, 93 KB] is confirmed for the 2018/19 year. The reseals from 2016 to 2021 will be carried out by HEB Construction Ltd as part of the Road Maintenance Contract. Approximately 85 km of reseals are programmed with a total budget of $3.5 million. The roads being resealed are determined by consideration of road condition data collected both externally (independent assessment) and internally (by Council staff and from the road maintenance contractor). Prioritization of reseals is governed by the road condition, strategic fit, best for asset considerations, financial prudence and road hierarchy. The reseals on rural roads are predominantly chip seals. Urban reseals are a mixture of chip seals and a thin asphalt seal. The thin asphalt seals are mainly placed on main streets within townships that carry the higher traffic volumes and at the end of cul de sacs to cope with the turning traffic. There is an increasing number of new urban streets as part of the subdivision development that have an asphalt seal so there will be an increase in the future urban reseals using asphalt. There is also the demand for some of the older streets in townships that have a chip seal to be resealed with asphalt to match the new subdivision streets. 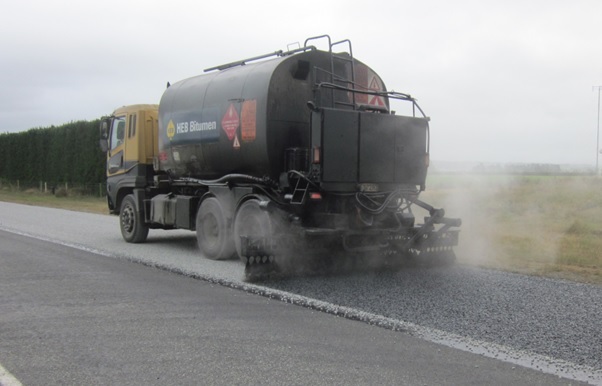 Preparation for the placement of asphalt includes surface levelling of uneven areas and milling at the kerb and channel and the start and end of the site to provide a tidy seal join. This work may be done a few days in advance of the placement of asphalt. Preparation for chip seals includes trimming of high shoulders to improve drainage, repairs to potholes and edge break, dig out repair of failed areas and surface levelling of slumped areas and trenches. This work is done as part of the pavement maintenance. To protect the reseal sites and workers during the resealing operation there will be reduced temporary speed limits set at the various stages of the reseal. These protect the new seal from damage while the binder remains soft and minimises loose stones flicking up hitting vehicles. For your own safety, the safety of the workmen and to protect the new seal, please observe the speed limit, it is usually only for a short distance. Even when there is no activity at the site if there are warning signs in place please take care as the carriageway may be prepared for the reseal or the reseal recently completed. The signs will not be removed until the surplus chip has been lifted and the road markings reinstated. The new seal remains susceptible to damage for many weeks after the reseal. Care is needed to ensure that there is not sharp turning of heavy vehicles, strong acceleration, etc. as these actions will cause damage to the new seal. We apologise for any inconvenience the resealing may cause and thank you for your patience while these works are carried out for the improvement of the sealed road network.